100,000 illegal migrants have been stopped from making the crossing to the UK in the past year. The data doesn't allow us to say this. This is an unofficial projection based on Home Office data and depends upon the assumption that foiled attempts to cross the border have continued at the same rate as in April to July this year for the rest of the year. 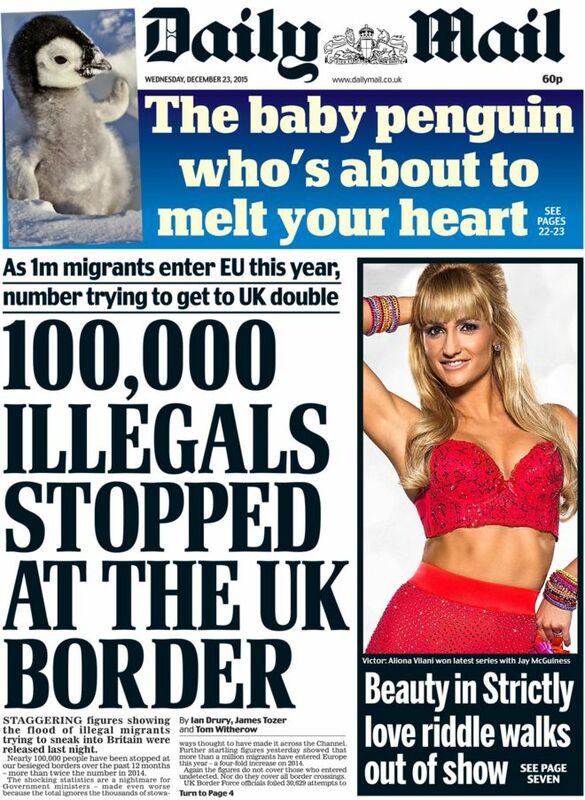 "Almost 100,000 illegals stopped at the UK border"
"Illegal migrants shock as 100,000 tried to sneak into Britain in the past year"
The Daily Mail's front page this morning claimed that almost 100,000 illegal immigrants have been stopped from making the crossing to the UK in the past year. As well as the Sun, the claim has been reported on by the Daily Express and the Telegraph. It's wrong to describe this figure as the number of attempts stopped in the past year, as outlets have. It's an unofficial projection based on Home Office data and depends upon the assumption that foiled attempts have continued at the same rate as in April to July this year for the rest of the year. This is by no means certain. The figures also don't refer to the number of unique people who have been stopped over any given period, rather the number of attempts that have been stopped. If one person makes multiple attempts to cross the border then they'll be counted multiple times. The Home Office has confirmed that the data for April to July that the articles use to make the extrapolation is correct. There's some confusion in the department as to whether this data has been made publicly available. We're trying to iron this out with them. In April to July 2015, 30,629 attempts to cross the channel illegally were stopped, according to the Home Office. The claim that there have been nearly 100,000 such attempts stopped in the past year comes from extrapolating this figure to a 12 month period, giving an annual estimate of about 92,000. The data on this topic has tended to be released sporadically, and isn't published in much detail, which makes comparisons to different time frames tricky. The outlets compare the 2015 estimate to a figure of 40,000 attempts stopped in the 2014/15 financial year, claiming foiled attempts have 'doubled'. The 40,000 statistic has previously been referred to in Parliament. Due to the uncertainty of the 100,000 figure, this comparison is problematic. A Freedom of Information request gives data for previous years, showing 19,000 attempts were refused entry in 2013/14, and in the three years before that the figure was around the 10,000-11,000 mark. We also have data for the number of attempts stopped in the same period last year, when there were thought to be 11,920 such attempts. This year's spring figures represent an increase of 160% on that period. So it seems fair to say that the number of thwarted attempts is increasing. We don't necessarily know the number of attempts to cross the border increased by this amount. The government has said that security continues to be strengthened, so it might be that this also incorporates improved detection. Are only 1% of illegal immigrants deported?